Crafted with choice materials and designed by qualified professionals in the window-making industry, the energy-efficient, durable, and aesthetic features of vinyl replacement windows make them a coveted asset for all homeowners. Vinyl windows are the perfect replacement windows for you and your family because they yield great return on your investment while improving the comfort and beauty of your home. 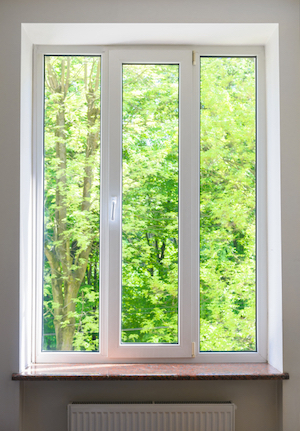 Beautiful and secured windows that come with a long life-span and virtually zero maintenance are hard to find. Global Home Improvement offers high-quality vinyl replacement windows to homeowners throughout PA, NJ & DE. Our vinyl replacement windows are made from premium materials that come with a variety of options to meet your personal demands. Besides offering you great customization flexibility, these windows also provide many attractive features unfounded in the market. Call us at 1-855-201-7963 or click below to schedule a free in-home consultation and estimate for window replacement in Ardmore, Doylestown, Cherry Hill or nearby. For this window replacement in King of Prussia, PA, we replaced the homeowners existing outdated, non-functioning bow window with our GlobalTech custom vinyl window to create a beautiful, new bay window. This particular bay window features 3 double hung windows with simulated divided lights to create a look both contemporary and classic. This ultra durable bay window will open up the room and help with room ventilation. Wondering what this style could cost for your home? Call Global Home Improvement at 888-234-2929 today. This before and after photo of a replacement window install in Bala Cynwyd, PA demonstrates the art of a good window installer. Not only did we convert a 3 unit window into 2 double hung units, but we also completely redid the exterior capping. The difference is absolutely stunning. At Global Home Improvement we pride ourselves on providing free window consultations to go over the various installation methods as well as window types. We specialize in vinyl windows, fiberglass windows from Marvin and wood windows from Marvin. All with a different benefit and budget. Wood windows, like the ones on this home in Philadelphia, PA, swell with exposure to moisture. This leads to the wood frame cracking and the insulative properties vanishing. These homeowners needed a quick, reliable, and low-stress window replacement, making our GlobalTech vinyl windows the perfect choice. They're built for durability and installed with performance in mind. They also opted for GTech 12 glass for maximum energy efficiency. This window and siding project in Philadelphia, PA, resulted in a gorgeous new renovation with a matching color palette. We installed vinyl slider windows with a beige interior and exterior and aluminum caping with a bronze finish. To match, we installed ultra durable Woodstock Brown James Hardie fiber cement planks. The earthy tones created a really great look, and the reliable materials ensure optimal performance. This vinyl window replacement in Cheltenham, PA featured our very own Global Tech insulated vinyl window. The existed single hung windows dated back and weren't performing to par anymore. Our Global Tech Insulated Vinyl window offers a cost effective, yet durable way to boost your energy efficiency and curb appeal through your windows. Increases the overall energy efficiency of the windows, and therefore, interior living space. Offers superior winter heating and summer cooling performances, due to its multi-cavity "super glass" design. Reduces more emissions of CO2 than other low-energy insulation glass. At Global Home Improvement, we understand the challenge of choosing the best vinyl replacement windows for your home. During your free in-home consultation, we take the time to provide you with personalized recommendations and answer any questions you may have along the way. Call or email us to schedule your free, no pressure estimate today in Woodbridge, Morristown, Bethlehem, Princeton, Short Hills, Jersey City, Reading or nearby!